Steel Roll Forming Machine Line, to forming steel coils/strips along straight, longitudinal, parallel bend lines with multiple pairs of contoured rollers without changing the thickness of the material at room temperature. What is “Roll Forming Machine” ? Roll Forming machine, also named “Roll Former“, which is a flexible and continuous process, where both the normal rules and the exceptions utilized. It have been proven several times that the roll forming machine accomplish roll forming tasks which even seemingly impossible. Although it may take a longer time and much more money. On the other hand, it also showed that plans to roll form simple shapes can create disastrous results. If the designer don’t follow the basic rules of roll forming. Cantilevered Mill, the shafts of the mill are supported at one end only. Duplex Mill, two cantilevered mills facing each other. So the mill can form both edges of the narrow or wide steel profiles. Thourgh-Shaft Duplex Mill, a combination of duplex and conventional mill. Standard (conventional) Mill, the shaft are supported at both ends. Rafted (plated) Mill, which can reduce the roll changeover time for roll forming different steel profiles. Side by Side Mill, further reduce changeover time. Various design of special application mills are in use by the roll forming machine industry. Maybe many of do not fit with the previous mills, but they also work properly. 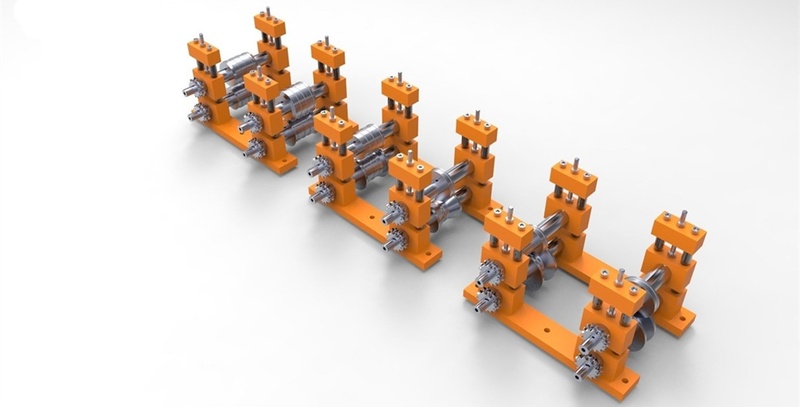 Straighteners, eliminate the bended or twisted product after exiting from the last roll forming stands because of the internal stresses. Lubrication System, used to reduce friction between the coils and rollers to avoid scratching or marring the product surface. Mechanical Cutting, which is old for newest roll forming machine. Hydraulic Cutting, widely used, which is easy to adjust the force, stroke, speed and accurate repeatability with electronic measuring system. Pneumatic Cutting, only used for small product, also not used now. Rotary Cutting(Saw Cutting), which is economical, and widely used in complicated profile roll forming machine, while it is difficult to use hydraulic cutting. But it make some noise. See more information of different position of cutoff unit. Stationary die, which is solidly assembled on the mills base. Flying Die, which can slide on narrow rails. while cutting, notching, punching, the roll forming mill is still work. we always used pneumatic or servo motor tracking design. After punching, removing a part of the material, the removed part is scrap. Punching, Perforating, Notching. And also complete other press operations in loose or tight line. After embossing and drawing, a part of the coil is stretched out of its original plane without shearing. Many products(such as doors and shelving) need to bend the ends of the section. In most case, the bend is perpendicular to the longitudinal bends made by roll forming. Some products( like U Channel, roofing sheets, steel silo, door guider track) need to be curved after cutting into length. Utilizing the continuous rolling pf the strips propelled by the roll forming mill. The top and bottom rollers are geared together. One roller hold the punch heads, and another roller hold the punch dies. What Believe Industry Company Offer? Furthermore Believe Industry’s Roll Forming Machines also for Guardrails, Strut Channels, Cable Trays, Posts, etc applications. In addition Believe Industry Company also supply coil process equipment: slitting line, cut to length line, blanking line for steel factory. If you are new in roll forming machine, you can answer or collect the information of “Questions To Ask Before Buy Roll Forming Machines” or contact usdirectly. we will teach you how to buy a suitable roll forming machine and how to maintenance the machine.Or read the FAQ for a brief information. If you have bought roll forming machines before. Also contact us. we will let you know a new technology of roll forming machine.